It’s always interesting to browse different styles of website designs from other industries. We’ve seen large images used in web design before, but the food industry in particular really whets your appetite with enticing photos of delicious meals. These images clearly introduce the nature of the site and make an immediate connection to the hungry viewer. Check out this showcase of 20 tasty website designs for restaurants and services in the food industry. Now, who’s hungry?! If you are working on a website that promotes a food business in a delicious way then you might want to have a look at this example. Munchery has an elegant website that uses impressive, high-quality representative food photos. The homepage features a clear call to action which invites the user to submit his/her email and receive the menu. 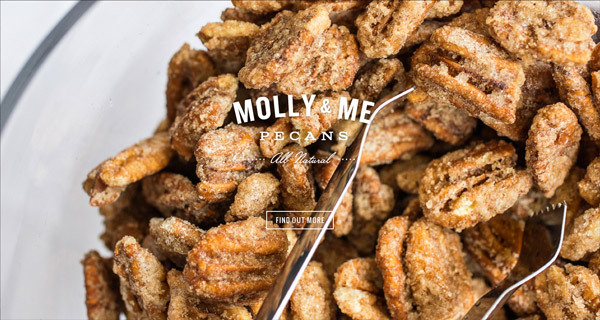 This website uses a large full-screen image of one of the restaurant’s specialties – sugar-coated, roasted pecans. It also has an elegant logo and and a simple and clear call to action button which invites the visitors to find out more about the website and the business. This is yet another good example of a website that presents a food business in a delicious way. This is the presentation website of a steakhouse. The design is simple, clean and showcases high-quality images of the food served in the restaurant to catch the visitors attention and make them book a table. This example can be a great source of inspiration. This website focuses on presenting a lemonade business. This website uses a large slider as the first thing a visitor sees and continues with horizontal bands of content presented in different and creative ways. You should really have a closer look at this example and see all the creative ways it promotes this business. This is yet another good example of a website designed for the food industry. It uses large, bold fonts, a fullscreen slider with high-quality images and smooth transitions and animations. Red is used as an accent color, and it is also the main color of the logo. Check it out live to see all of the animations and details at scale. Florentina website has an elegant design which can definitely grab one’s attention. This website has a huge slider on which some really nice and delicious pictures roll. The layout is ultra-minimalist, with simple fonts, lots of white space and clean details. Claw Bar has a nice logo and a neat and elegant way of promoting their business. Like most of the food websites on this list, it uses a large horizontal slider on the homepage. You should also check out this restaurant’s impressive menu. This is yet another website that has an elegant form of presentation and a really neat web design layout. Unlike the other food websites showcased on this list, this website uses a hand-drawn illustration instead of a real photo. It adds to the vintage style of the brand and creates a retro atmosphere. Whoa Nelly can be a great source of inspiration for future projects. The Whig is one of the greatest dive bars you will find in the U.S.A. which also has a nice website. The website promotes the business in an elegant way that can definitely be a great source of inspiration for future awesome restaurant websites. This website has a much more minimalist design than the rest but still manages to grab its visitors’ attention through all the good food-related content it posts. The menu is simple and uses icons to better illustrate each tab. It also has a small slider on the homepage, a newsletter signup form and lots of white space to enhance the photos shown in the slider. This is quite an interesting website. It uses animations and plenty other creative ways to present and promote this business. Its layout is unique and successfully combines 3D images with flat elements. This is yet another good example of a food-related website that has an elegant design. You’ll see a different background picture each time you will enter the website. This is a great way to break the monotony people get when seeing the same photo when they want to order food from a specific restaurant. La Porte is yet another good example of a website that has an elegant yet delicious design. This website has a centered menu bar under which a slideshow of short films rolls. The background image is blurred and darkened to enhance the menu element. If you liked the previous examples then you will most likely adore this one! Arbor restaurant has a really neat and elegant design, with a large slider and a vertical menu bar. The slider has a custom navigation system worth seeing. If you are a fan of iced “delights” or you are simply working on a similar project and you couldn’t find your inspiration, then you might want to have a closer look at this website. It has an eye-catching design which can definitely promote any business, not just this one! Get inspired by the way photography was combined with large, bold fonts, in this food-related website design. You should also check out Jim ‘n’ Nick’s BBQ restaurant and prepare to be impressed by this amazing website. It has a cool menu which definitely adds personality to the site and some representative photos which might make you a bit hungry. This example is worth following and having in mind when working on similar projects. 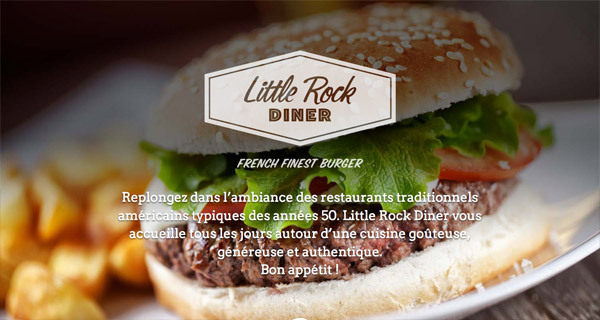 Check out the Little Rock Diner’s website. It has a vintage vibe to it and a very simple, minimalist design. The homepage has a large, professional food photo in the background, with some blur added to it to focus the attention on the center part of the screen. Are you a fan of Jamie Oliver? Or are you simply working on a food-related website design? Have a look at this website and check all those tiny details which were carefully thought out. The grid, horizontal slider can look great on food-related websites, just like in this case, as it shows multiple images at once, instead of just one at a time. Hella Cocktails has an eye-catching design which is perfect for a website that promotes drinks. Instead of adding lots of graphic elements to the layout, this website just uses quality product photos which are more than enough to let the visitors’ know what this site is all about. Last but not least, have a look at Pastini Pastaria’s delicious website which combines beautiful fonts, with vintage design elements and high-quality, large images. The logo is placed in the center of the menu bar and divides it into two. Check out the live version of this site to see all of its details. Great collection of food designs. I have checked many of this and found “munchery” design very delicious. Thanks! Great sites, very much interesting works of designs. These are helping to make a very good approach for restaurant website design. Nice collection. Just what I was looking for! Really inspiring food related website design,, thanks! Out of all of those designs, I think my favorite has to be Arbor Restaurant. Really love the look of it. Great Solution. This Tips will Help Us Very Much. Thank you very much for Sharing with us. Must say, nice collection, was just looking for some inspiration for a project i’ll be working on soon. I don’t know, some are pretty nice but a lot of them just seem to rely exclusively on images. 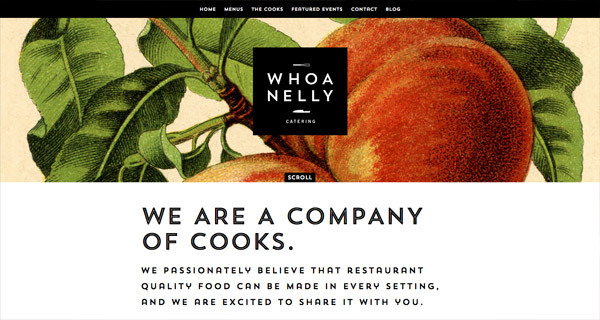 Some great food websites,feeling lucky to launch here.Great share. Another website that won the best restaurant of the year award and part of the BiCE group is Sapori di BiCE. They have the best Italian chef working for them in Dubai be sure to check out their menu styled website design. I can smell the sizzle coming from Black House’s website lol. A delicious set of examples, I would love to visit The Whig’s restaurant after seeing their menu. A yummy selection of websites and design inspirations.